“No one is born racist”. 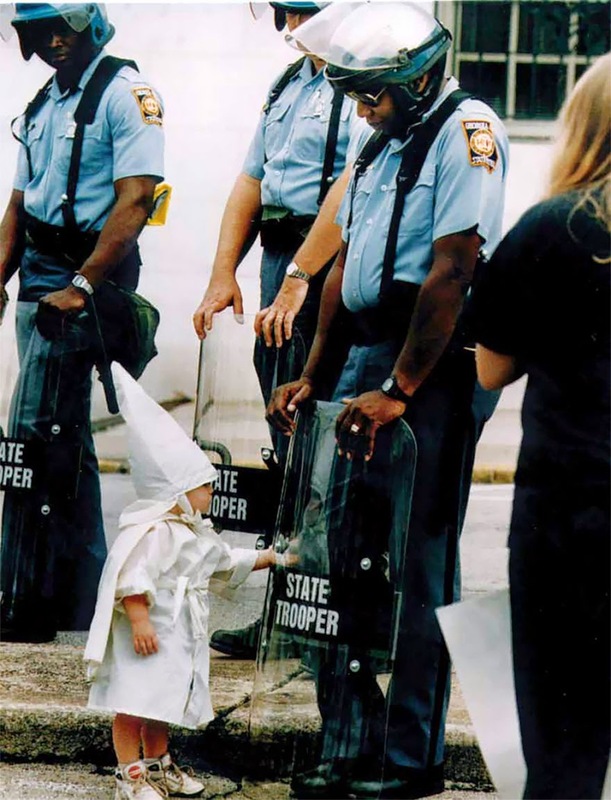 A white child and a black State Trooper during a KKK protest, 1992. The Trooper is black. 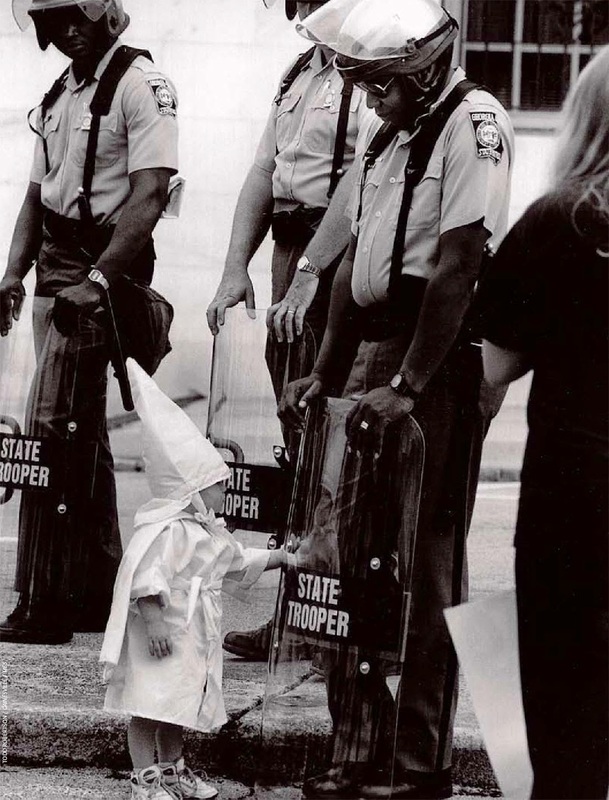 Standing in front of him and touching his shield is a curious little boy dressed in a KKK hood and robe. In this picture innocence is mixed with hate, the irony of a black man protecting the right of white people to assemble in protest against him. The Ku Klux Klan was holding a rally in the northeast Georgia community of Gainesville, where the white supremacist group hoped to breathe some life into its flagging revival campaign of the late 1980s and earl 1990s. Assigned as a backup photographer for the local daily, The Gainesville Times, was Todd Robertson. At the Klan rally, there wasn’t a tremendous amount of action for Robertson to record. According to news reports from the day, there were 66 KKK representatives, encircled by three times as many law enforcement personnel. The downtown square was otherwise empty, with about 100 observers at the fringe, mostly there to demonstrate against the Klan. The white supremacists were out-of-towners with no real local support in Gainesville. Many people who came to these Klan events were not from the city. While reporters and the staff photographer focused on the speakers at the rally and watched for potential signs of conflict, Robertson chose to follow a mother and her two young boys, dressed in white robes and the KKK’s iconic pointy hats. One of the boys approached a black state trooper, who was holding his riot shield on the ground. Seeing his reflection, the boy reached for the shield, and Robertson snapped the photo. Almost immediately, the mother swooped in and took away the toddler, whom she identified to Robertson as “Josh”. The moment was fleeting, and almost no one noticed it, but Robertson had captured it on film. Since that moment the photograph has become an iconic image of American race relations and to the postulate “No one is born racist”. Here’s the colored version of the photo. “I didn’t even see the kid. I was just looking down to see what was bumping on my shield. And when I looked down, there was this little kid in a Klan uniform. He saw his reflection in the riot shield. He was tracing his outline. The child was oblivious to what was going on around him”. Campbell did have some sympathy for the little boy named Josh. Neither Josh nor Campbell chose to be there that Saturday on Labor Day weekend in 1992, the retired trooper said. “The State Patrol made me be there. His momma and daddy made him be there”, said Campbell, who retired as a master trooper in 2009. I feel sorry for the boy. I wonder if he grew up to hate or if, based on this, he is more tolerant and compassionate than his racist and bigotted parents. Teaching children to hate is child abuse! This is extremely touching and strangely innocent considering the circumstances surrounding it. You can see Trooper Campbell's smile as the boy touches the shield. Very great photo. Here's to hoping the boy grew up to have a better mentality than his parents. I think it definitely speaks to the officer's character that he recognized the boy was innocent. He was simply a product of his parent's environment of hate. Like others, I hope this child grew up to understand the ramifications of racism. The Trooper looks almost amused by the child. This is not only a picture but a mirror as well. Please study the photo in depth to be certain that you don't find your reflection hidden in it's background.